And I cannot even believe it! A last minute trip to see my sister, brother-in-law and niece and nephew this week resulted in the product that I have been drooling over since September! The Nook! And I got the new one - the Nook Color! My sister, the photographer, took the below pictures - visit her at Digital Graces! I must admit - I did research on the various options out there, but I really had my heart set on the Nook, primarily because I liked the idea of being able to bring it into a Barnes & Noble store if I had a question on it and I could then talk to a real human being instead of having to mail it out someplace. Here is the main reason I wanted an electronic device - I travel for work frequently and trust me when I say, The Historian hardcover is no fun to carry around through airport after airport when you're also lugging a carry-on and a briefcase. But I worried about whether or not I could truly sit still and read from an electronic device and be as satisfied with this form of reading versus the actual feel of book and paper in my hands. The feel of the pages turning, the smell of the book. I thought I would hate reading an electronic version. So I planned to download The Passage if I ever got something like this since I've read more than enough reviews on how fantastic it was. I figured this would be the book that would help initiate me into the world of reading electronically. I absolutely love it! The Passage was just the trick to open the doors into this type of reading - and the Nook Color is fantastic! The colors are wonderful, and if there is a wi-fi available, I can just connect to it and jump onto any site that I want to, so it has a multipurpose function. It also has a bunch of extras already downloaded such as Pandora and Sudoku - so I don't think I will ever have a problem dealing with my travel again! If you are brand new to an electronic device, make sure you download a book that you know will thoroughly engage you. It wouldn't have been wise for me to download a classic to initiate me into this e-reading world! 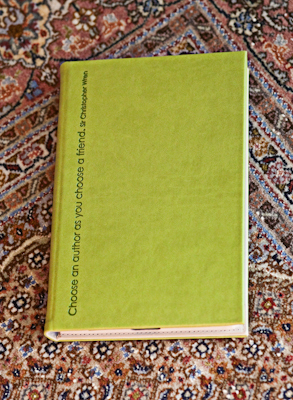 I also got a fantastic Nook cover as well with a wonderful quote from Sir Christopher Wren. "Choose an author as you choose a friend." So on this New Year's Eve night, I will be celebrating with family and a fabulous book! I hope you all have a safe and Happy New Year! That is so awesome! If I traveled as much as you do, I would definitely want one. It's very sleek, and I love the cover. Glad your holiday was good. Happy New Year! I got a Nook for Christmas too! I'm still playing around with it, but I know it will be a great thing to have when I travel. Happy New Year! Awesome!! I want the nook color but I have the regular nook and I don't think I've used it enough to warrant an upgrade yet, LOL. Have fun with the nook and have a happy new year!! If I traveled, I'd get one too! (It makes a lot of sense.) But I don't, so I won't. I hope you have a lot of fun with it. I didn't get a Nook for Christmas but part of my loot was four terrific books. I'll be reviewing one of them next week. Wonderful! I'm sure in no time you'll wonder how you managed without it. I never thought I'd be tempted to forgo the real thing but I have a feeling the time is not far away. I have the first version of the Nook and can completely agree with you about how wonderful it is to travel with! I enjoyed it immensely when I went on vacation. It wont replace my actual books but I can't imagine not traveling without it! I love the cover for your Nook! I have a Kindle myself and having an e-reader has been wonderful. I'm sure you'll like it. Happy New Nook to you. I am also just starting to see the convenience of not carrying a hefty book. I got a Nook this summer, and love it for all the reasons you state. I can take 79 books with me everywhere I go (and most of them were free!). I admit, this has not completely stopped me from buying books I can handle and touch. It is still my preference to hold a real book and turn real pages. But the Nook knocks my socks off for convenience and portability. Enjoy your (color!) Nook and have a fantastic New Year! What a gorgeous cover - wishing you many hours of happy reading and downloading! Ereaders are addictive! My husband and I have had a Kindle for a couple years and I have a feeling I'll be reading more on it in the upcoming year. I've been slow to warm up to it. I am still on paper. I am not a techno phob but I want to research this ereader technology more before I get one. One disappointment I have already is that the screens are not backlit. I need to be able to read in dim light. I wonder what ereaders will have to tempt us by next Christmas? Love the cover! Have you discovered the Project Gutenberg website yet? I really should use my ereader more (I have a Sony Reader) but it's unfortunately a little bit buggy. Nice bright cover for your Nook. Glad you are enjoying it. I got a Kindle this Christmas and love having lots of books fit in my purse! Great post, and really good advice! Looks like there will be quite a bit of traveling this year, so I'll be purchasing an e-reader. 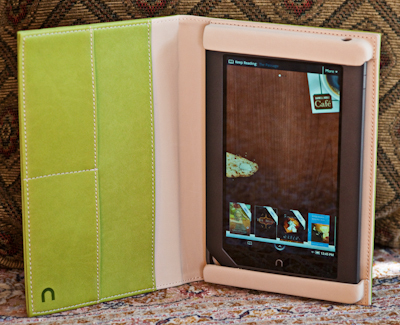 Have pretty much settled on the Nook color... hopefully making the purchase by the end of the month. Woohooo!!! Another e-reading convert! LOL I still have the original Nook and I really do adore it. I read several books on it before I read THe Passage, but The Passage was one of the first books that really let me see past the device. Now the Nook has become my favorite way to read. I read faster on it!!! Crazy, I know. Very nice! And The Passage is a brilliant book. Have fun! Hopefully you have some extra tim eto read this weekend. My friend just got the color Nook for Christmas to replace her old one and could not stop raving about it last night. Have fun with yours! I bought the regular Nook this Summer, so I can't justify the Nook Colour, but it is really a lovely gadget. I love how you can turn the pages witha flick of your finger rather than a press of your thumb repeatedly on the button. Also, the colour is so bright and appealing! I'm happy you have it; although it doesn't replace the pleasure of a real book, it has lots of merits on its own. 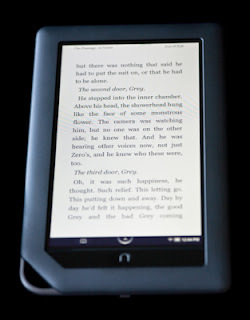 How do you like the Nook Color compared to the regular Nook? I heard that it is not as good for reading books because it causes more strain on your eyes. I love the colors of the cover. Color me green! I thought I was getting one for Christmas, but the general consensus among my older girls was that I needed bookshelves more, and they spent days traipsing around trying to find nice sturdy ones that wouldn't cost $600 apiece! So .. now I wait for my birthday in March, and if one doesn't show up for me then .. well, I'll pony up and buy my own! Enjoy! Welcome to the e-reader world! And isn't it wonderful to only have to carry what - a pound? as compared to the 2,477 lbs The Passage weighs? I am so very happy for you!!! and such a beautiful cover! Did you get a good booklight too? It will make your traveling with a book (or 60) so much lighter and easier! Enjoy! and Congratulations! I just love that green cover... I'm not yet converted to the Nook or any other device, but this looks just about perfect for my travelling bag. Have fun with it! Happy New Year! Woo hoo, lucky you!! I have the original Nook and I'm still surprised by how much I love it. I'm glad to hear the color Nook is just as wonderful and that you enjoy it! Happy New Year! Fantastic gift! And great advice - when I got my ereader I started by reading some light YA novels and that was the trick to getting me hooked. I also love the Kindle for travel. I used to have multiple books stuffed into the laptop bag and the purse and it gets a bit heavy ;) Enjoy! Congratulations on the new Nook! It is really very neat looking, and I love the cover as well! I do hope that you enjoy The Passage on it, as that is one that I own on my Kindle and really, really want to read soon! I just have a Nook wifi, but I love it! Glad you're enjoying yours!! Great! I love my kindle. It fits great in my overstuffed purse. I take it everywhere, but still love the smell and feel of ink on paper, so I always have a book-book crammed in my overstuffed purse too! Happy New Years to you too! I'm still on the fence about e-readers but the portability alone for something like The Passage is pretty compelling. That book is on my tbr list too, so I'll be interested to read how you like it. I got a Kindle for Christmas from my in-laws and I love it, too! Like you, I was worried about how I would handle reading from an eBook reader rather than a book. But with the Kindle, the pages look exactly like pages in the book (and no glare-y screen!). I'm definitely so glad I got this. Hope you enjoy yours and I hope you had a great New Year! Enjoy your new Nook and I LOVE that cover you got for it! Happy new year! And happy tinkering with your new toy! 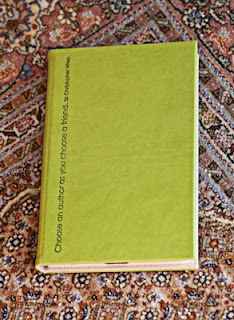 Love the quote : "Choose an author as you choose a friend." Lucky you, lucky you, enjoy. I was anti-eReader, but I do love my Kindle and iPad....I'm a partial convert at least. Congratulations! My husband was actually the one who pushed me to get a nook. I guess he was tired of hauling around my overweight luggage! We don't travel as often as it sounds like you do, but often enough that we felt we could justify the cost. I still prefer the real thing, but I'm happy with my nook too. And The Passage! I've heard so many great things about it! I really need to get to it soon. Congrats on your new Nook (did you name her/it? ) 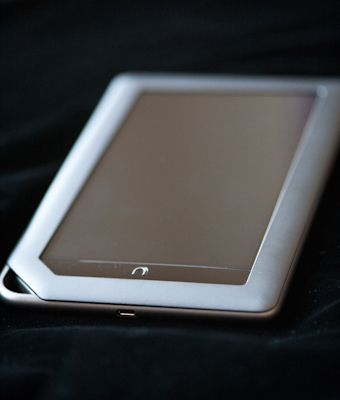 I bought the Nook in May (named Pippi), but haven't read many books on it (her?) yet. Yaaaaaay, what fun, you will love it. I got a kindle last year and absolutely love it. My only issue is I don't think it is great for traveling because you can't read it at take off or landing which is over 30 minutes of flying, sigh. Woo-hoo! Lucky you. I got a Kindle for Christmas, and my daughters are already drooling over it, so I think there will be another e-reader in our future! Happy New Year! I'm so glad you love it! I got a Kindle for Christmas and I'm nervous about what I should read first. I want it to be something that really engages me, like you suggested, so I'm not immediately put off. Enjoy your Nook! Excellent advise....We should remind everyone to be sure and download a good first book. Oh how cute is your new gift!!!!! I have the original Nook and haven't had it long enough to allow an upgrade but I am getting used to reading on it. Have fun with you new Nook. Enjoy your Nook! I think you gave some great advice about having the first book be something you're sure you'll enjoy. Congrats on the nookcolor! I have a nook but I would love to have the color as well! I totally agree with you on the primary suggestion, if you are new to ereading. My first couple of books were so boring that I thought I will never love ebooks! Have fun!